Two cases involving several indigenous communities affected by the Bakun Dam (Bato Bagi & Others v State Government of Sarawak) and a proposed pulp mill factory in Tatau (Jalang Ak Paran v State Government of Sarawak & Another) won the right to appeal at the Federal Court. The cases involving 5 longhouses in Upper Balui and 1 longhouse in Tatau were heard at the Federal Court today before a panel of 3 judges. The Bakun dam case was filed in 2000 while the Tatau proposed pulp mill factory was filed in 1999. Both suits were filed against the State Government of Sarawak. In both cases the natives challenged the Government’s acquisition of their customary land and sought declarations among others, that the provisions of law acquiring native customary land and rights under the Sarawak Land Code were inconsistent with fundamental rights under the Federal Constitution i.e. right to life under Article 5. 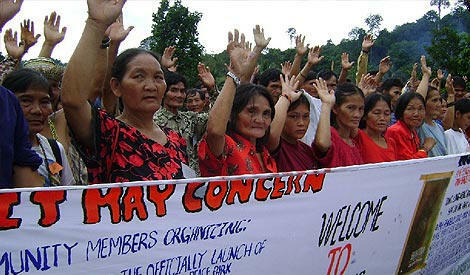 In the Bakun Dam case, the indigenous communities were seeking compensation for lands lost as a result of the acquisition. 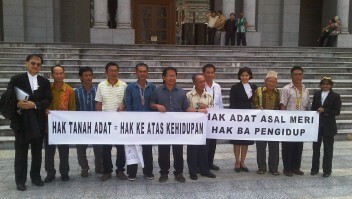 The communities were represented by senior counsel Hj Sulaiman Abdullah and NCR lawyer Baru Bian. The State Government of Sarawak was represented by Dato’ JC Fong, from the Sarawak Attorney General Chambers. Present also were lawyers from SAM. At the Federal Court, both parties agreed that since the case of Bato Bagi & Others and Jalang Ak Paran & Another had similar arguments, the Court would hear them together. 2. If they are, then, can they be extinguished (taken away) and if so, what should be the procedural and substantive characteristics of the law extingushing such a right to life. 3. What are the terms of the fiduciary obligation of the State to the natives and how this should be reflected in the law allowing extinguishment. 4. Given that these are NCR rights and there is a fiduciary relationship between the State and the natives, what is the procedure and nature of compensation. Whether Sections 5(3) and (4) of the Sarawak Land Code are inconsistent with the provisions on fundamental rights within the Federal Constitution. The cases will be heard on 28.04.2011 in Putrajaya. The communities were present in court and were jubilant with the decision despite it being just an application for leave to appeal. Sahabat Alam Malaysia (SAM) is pleased with this decision and and hopes that the court will vindicate the communities with a favourable decision. Congratulations to all those involved! Another win ( a plus ) for us the people of the land. Pencuri tanah, nyahlah kamu!